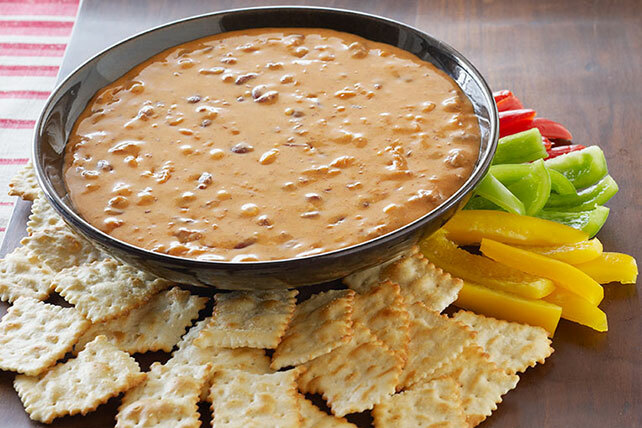 Grab some veggies or crackers and dip into our delicious VELVEETA® Chili Dip! All you need to make this chili dip is 10 minutes and two ingredients. Serve with tortilla chips, crackers and/or assorted cut-up fresh vegetables. Microwave 1/2 lb. (8 oz.) VELVEETA, cut into 1/2-inch cubes, and 3/4 cup canned chili in medium microwaveable bowl on HIGH 3 to 4 min. or until VELVEETA is completely melted and mixture is well blended, stirring after 2 min. Makes 1-1/4 cups or 10 servings, 2 Tbsp. each. Mix 1-1/2 lb. (24 oz.) VELVEETA, cut into 1/2-inch cubes, and 2 cups canned chili in large microwaveable bowl on HIGH 4 min. ; stir. Microwave on HIGH 4 to 6 min. or until VELVEETA is completely melted and mixture is well blended, stirring every 2 min. ; stir. Makes 5 cups or 40 servings, 2 Tbsp. each. Substitute 1 pouch (4 oz.) VELVEETA Cheese Sauce for the cubed VELVEETA. Microwave chili and VELVEETA Sauce in microwaveable bowl on HIGH 3 to 4 min. or VELVEETA Sauce is completely melted and mixture is well blended.